De ideale plek om Brugge en zijn inwoners te ontdekken. Aanbevolen door de "Rough Guide" en "Le Guide Routard". Karel en Bénédicte verwelkomen u vriendelijk in het gezellige familiehotel de Goezeput, gevestigd in een 19e-eeuws klooster. Samen met zijn zus renoveerde hij het hotel en op het gelijksvloers bevindt zich een bar-salon waar ook de Bruggelingen graag langskomen voor een gezellige babbel met een aperitiefje. We bieden u een gezellig verblijf waar u vriendelijk onthaald wordt in een sfeervol kader. If your idea of a good hotel includes a lot of glass, metal and shiny surfaces, move on. This place has Character. The third-floor room (#14) I stayed in had an exposed-beam vaulted ceiling and a large amount of space with a sitting area partly walled-off from the sleeping area and bathroom. The bathroom is recently updated but the difficult sliding glass door and the temperature variation of the water in the morning knocked-off one rating level. (A request to remedy the slow-draining shower was immediately and cheerfully attended by the owner.) The staff seems to be a close-knit group and Karl, the owner, was cool, generous, and very helpful and accommodating -- I saw him nearly every day of my week stay. He's obviously integral to the daily functioning of the hotel. I couldn't ask for a better location and the fellow guests that I met were world travelers interested in meeting and talking with other fellow travelers. The location is ideal at about a 6-8 minute walk from the Markt center. Be sure and let them know the night before if you'd like an early breakfast -- they actually do that. Good music and cold beer, a variety of bottles if the Juliper on-tap isn't your thing, are available at the bar. I'll definitely stay there again. Nice place, great ambiance and perfect location. Near the center but still in a quiet neighborhood.. Helpful staff. PS. I hope the coffee is stronger. I enjoyed my stay at the hotel. The staff came across kind and professional. The rooms were clean and tidy. Wifi reception was good in room 12. The staircase from the ground floor made a lot of noise. I was happy to sleep on the second floor. We really enjoyed our stay at the lovely relaxed hotel. Great location for us - between the train station and the main centre. Only a short walk to all the sights, bars, restaurants, etc. Lovely room (ours was a superior double on the top floor), nice breakfast with good quaility ingredients and good value. If we return to Bruges, we will definitely stay here again. Awesome place to stay. A family run business that caters to their clientele. Eager to help you with your stay in this beautiful city. They guided us to great restaurants and the tourist destinations that we shouldn't miss. Our stay was greatly enhanced due to their personal service. A huge thank you to Karl and his staff! First of all thanks for your attention with us. Our stay was perfect in your hotel. The worst was men at work in the oposite bouse, the noises, but this is not your fault. The best, in general, your attention. Best regards. The hotel is good and so close to the centre of Brugges. You can reach the best parts in just few minutes. The rooms are clean. The only problem is, its a bit noisy but this can happen in an old building. Very Nice and cosy hotel. Clean and nice room. Was hot , so could have been xtra nice if a fan was provided in room. Hotel was in quiet street, but old stairs made it noisy when guests coming in late at night. Felt like they where coming in to my room (nr 2). Nice breakfast and good coffe. Booked room with breakfast included, so a bit surprised when checking out, that it was NOT included. Should have been told when checking in. Nice and friendly staff..
Great central location. Friendly helpful staff. Mix up with our booking from the booking agent but gave us breakfast because of the confusion. Clean rooms and other areas. Breakfast good. En-suite very small with very little space to put toiletries etc. Broken leg on bedside table. Wardrobe doors wouldn't close/lock and only contained 4 coat hangers. Safe was locked when arrived and still not been opened when checked out. Room very hot and no mosquito nets which meant we both got bitten. We stayed at Hotel Goezeput for 1 night and enjoyed our stay. I loved the location of the hotel - little bit away from the central area, but still only a 5 minute walk away. Also the street leading up to the hotel from every direction are very beautiful. I loved how old the hotel and the building was - felt very authentic. The staff at the front desk was very friendly and helpful. We stayed in room 1 on the ground floor, which wasn't the best option. It was right next to their garage/storage area so a lot of traffic coming through your hallway during the day and a lot of door slamming. Thankfully they closed the bar around midnight and everything quieted down, so we were able to get a good night sleep. I would recommend this hotel and would stay here again (perhaps would ask for a room on the upper floors though). Good location. View from our room (room 6) is very nice. Room is very clean and bathroom is roomy. The decor in the reception/bar/dining area is beautiful. Would suggest an elevator in the hotel, especially to help those with luggages and elderly. Overall, would stay in this hotel again. De bedden waren door gezakt en het was erg warm op de kamer. Verder een goed hotel. Very nice hotel with friendly staff, clean rooms and bathrooms, delicious buffet breakfast, not far from the centre of the city but in a quiet area. I'd certainly recommend and would look to stay there again next time I'm in Bruges. Great location, lovely friendly and helpful welcome. Room was big enough and nice large windows. Bathroom was nice, but shower didn't drain well and there was a large bulge in the ceiling which was a little worrying. Single glazing also meant it was a little noisy, and stairs were creaky. Breakfast was good and common area was also nice. Reasonable for the price in an expensive city. 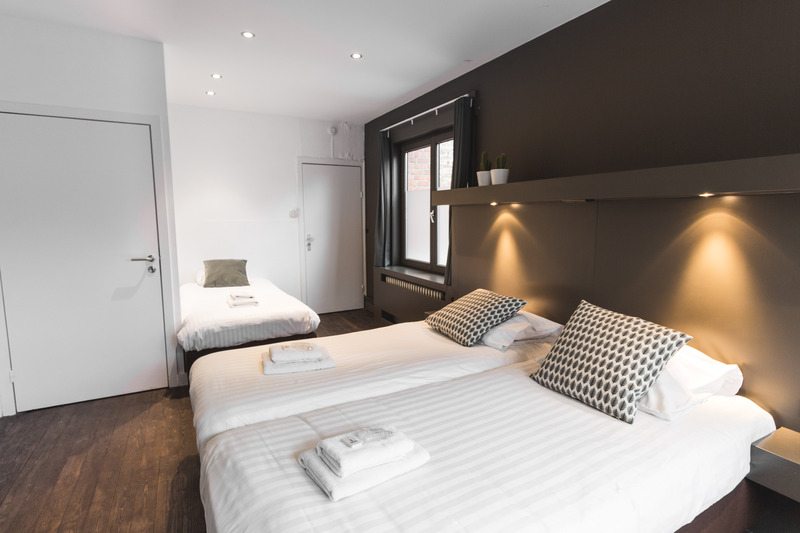 Very enjoyable and comfortable stay.Polite,pleasant staff always ready to help,and always with a smile.Clean and tidy rooms with comfortable beds.Great location for exploring the beautiful city of Bruges.It is the second time i have stayed here, and i would definately stay again. Muy confortable y hermoso. La decoración es de buen gusto y acorde con la Ciudad. Me hospedé en el último piso y la habitación tenía vigas de madera en triángulo. Compliments nous avons adoré ce merveilleux hôtel. Accueil et service excellent. We thoroughly enjoyed our stay at your hotel. Our room on the top floor was beautiful with its beamed ceilings and skylight, lovely decor, and a spectacular view of the city. We hope to see you again on our next visit to Bruges. Staff was very very friendly. We enjoyed our stay. Close to everything in Bruges. Except we didn't like staying in room 6. It is right above the front door. With people coming in and out all night it was hard to sleep. The front door doesn't open easily and makes a lot of noise. They should really fix that. We enjoyed the breakfast too. Friendly staff, clean, perfectly situated and reasonable prices. You can go there! Perfect! Comfortable bed! Perfect location! The hotel was lovely. It is about 3/4 mile from train station. Location is near the sites. The room was very clean and large. The owner/manager was very helpful and friendly. We would stay again. Nice hotel with friendly staff close to the city center. Great location and an amazing building and rooms. However, since it's an old building and we had a room on the top floor it got quite hot and the water pressure/temperature in the shower was unreliable. But in all it was a great stay much thanks to the helpfulness of the staff. I expectore more of the hotel. Simple , clean . Recepcionist in the morning rather distant for the job. Breakfast OK The best is the location. Ha sido excelente. Me gustó mucho y también las atenciones. Sin dudas volvería a este lugar. Lo recomiendo. Heerlijk hotel in het hartje van Brugge. Comfortabel slapen in een mooi middeleeuwspand! As separatly wrote in Booking.com, Wi-Fi signal in the room was so weak. It seems you need improve this factor as long as tourists do lots of things in their room with their mobile. Also, if possible, please let staffs close the door (right next of room 8 at 1st floor) silently as it made me very uncomportable in the morning. Except these two things, all were good to stay. Hope it helps your improvements. Very enjoyable stay. The location was perfect, the price very reasonable and the staff were most helpful and accommodating. Excellent place to stay in the centre of Brugge. Very clean and tidy. We had beautiful views from our top floor room. Thank you for making my stay so enjoyable. Your staff are very friendly and helpful. Nothing was too much trouble and the breakfast was great. Lounge area very stylish and relaxing. Excellent location too. Tea and coffee making facilities in the room would have made my stay perfect. I thought it was a lovely place to stay. The room was light and airy with the perfect location to explore. Service was uitstekend, de badkamer was schoon en het ontbijt was goed en uitgebreid. Alleen het bed was matig. Bij mij was het matras erg dun en doorgezakt op bepaalde plekken. Dit is erg jammer, want verder was het verblijf erg prettig! Beautiful little hotel in a gorgeous building. Modern & comfortable with friendly staff. Totally enjoyed my stay, thank you. Nice place. Close from all. I recommend. No se puede traducir al español. El trata, la habitación y la situaciñon del hotel ha sido correcta. 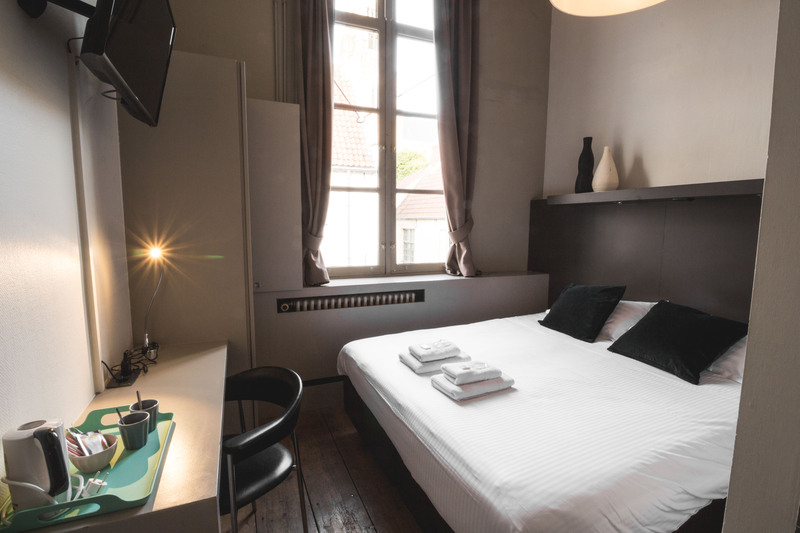 The Hotel Goezeput is a charming hotel in a great location in Bruges. Four of us stayed in a large, comfortable room overlooking the street. 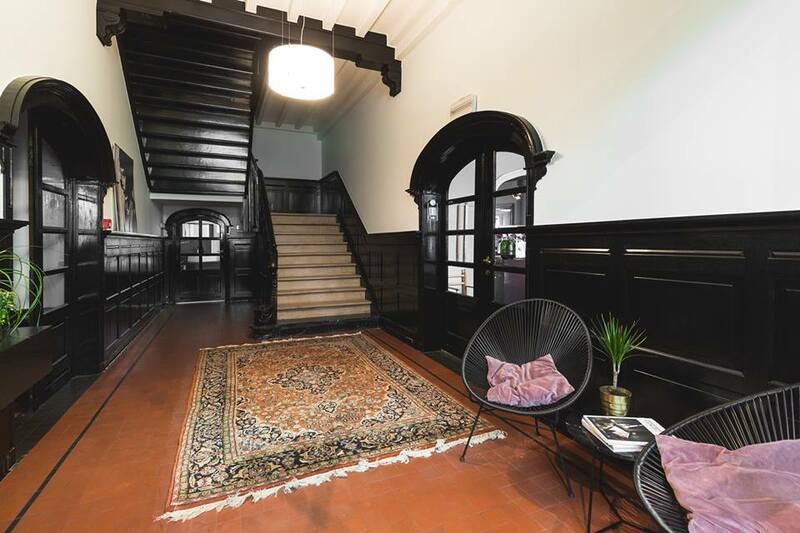 The building is a former monastery residence that is very quaint, but the bar-breakfast area is very modern with a fireplace and a small outside patio. Our room was very clean and the bathroom was spotless. Surprisingly, the street noise was a little louder than I would expect for such a beautiful old city. But I noticed on my walkabouts that EVERY street was rather noisy, so I think all the hotels must deal with the cobblestone traffic. The Grote Markt is only a 5 minute walk; but the entire town is eye candy, so walking anywhere is not an effort. Restaurants and pubs is the name of the game in Bruges and the difficulty is choosing which one to fall into. hotel location very good, staff very friendly & helpful, rooms very clean would definitely stay there again. Very friendly service in a unique atmosphere: the mix of old building structure and modern interiour was both fascinating and inviting. The location was just perfect for a quick tour round Bruges center. Highly recommended! 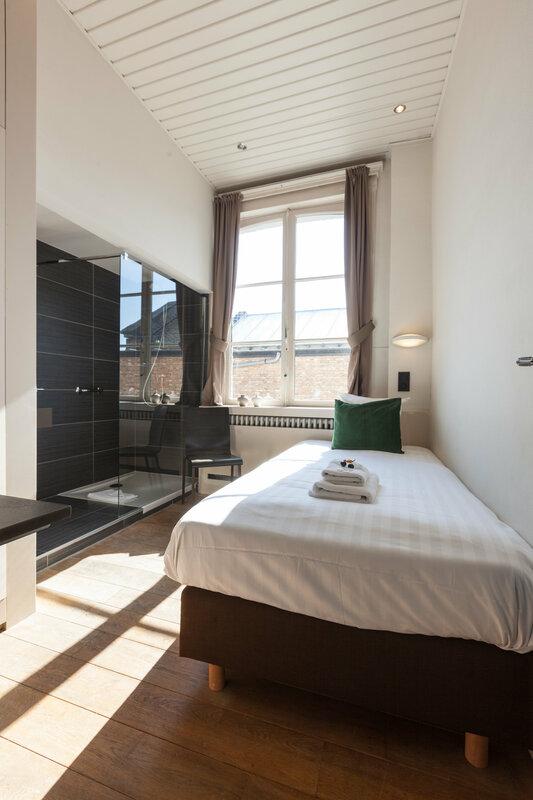 This hotel is ideally located right in the centre of Bruges about 2 minutes walk from the St Saviour's cathedral (where you can catch a bus taking you to most place of interest in the city) and 10/15 minutes walk from the main sights including the market place / the Burg, the Beguinhof etc. The hotel itself is in a lovely old building, perfectly fitting with the rest of the city. We were a party of 5, including 2 young children and stayed in 2 separate rooms. Both were of very decent size, well appointed and clean, and the staff couldn't have been more helpful with us during our stay. There is also an excellent choice on offer at their continental breakfast. As most locals they do speak fluent French and English which was great for us. All in all, we would definitely book there again next time we go to Bruges. Hotel prima, ontvangst prima, zou er zeker nog een keer naar toe gaan. Miste alleen de fles wijn als welkom. Bescheiden, leuk, gezellig. Op ideale wandelafstand van het NMBS station en het stadscentrum. Zeker voor herhaling vatbaar! Nice and clean room, very friendly staff! Perfect location and nice breakfast. It was a really enjoyable stay, one of the best beds I ever sleep! So quietly and warmly. I really hope to come back. Staff were really friendly and helpful, loved our little loft room and the location was spot on for visiting local bars and restaurants. Nice hotel central in Brugge. Friendly staff and a very nice room on the second floor. Free wi-fi. Fresh towels when needed. Mi estancia en este hotel ha sido perfecta! La ubicación muy buena. La habitación muy bonita, limpia y con vistas a la Catedral. La recepcionista Maria, española, un encanto, nos recomendó sitios donde comer, hablamos con ella de cine, de música etc. Recomendaría este hotel sin duda. Great location, friendly staff We stayed 3 nights there, the location is great. A supermarket is close by and the POI are all in a walking distance. The only thing that needs to improve is that there is no kettle in room to make a cup of tea or coffee. Parfait. Nous avons été très bien accueillis. La chambre était grande et confortable. Lovely hotel with wonderful people on the front desk. Nice hotel. Breakfast time ends too early. Certainly in a weekend. Leuk hotel,goede ontvangst, vriendelijk personeel,goed verzorgd ontbijt, 1 min puntje gehorige kamers je hoord de buren heel erg als deze geen rekening houden met andere gasten., Badkamer wel erg krap maar wel te doen. We really enjoyed our stay. The hotel is in between the station and city center. The hostess was very kind. She recommended a very nice local restaurant because all restaurants in the center are full on a Saturday night. Breakfast was fine and often refilled. The beds were okay, but the pillows were not that comfortable. 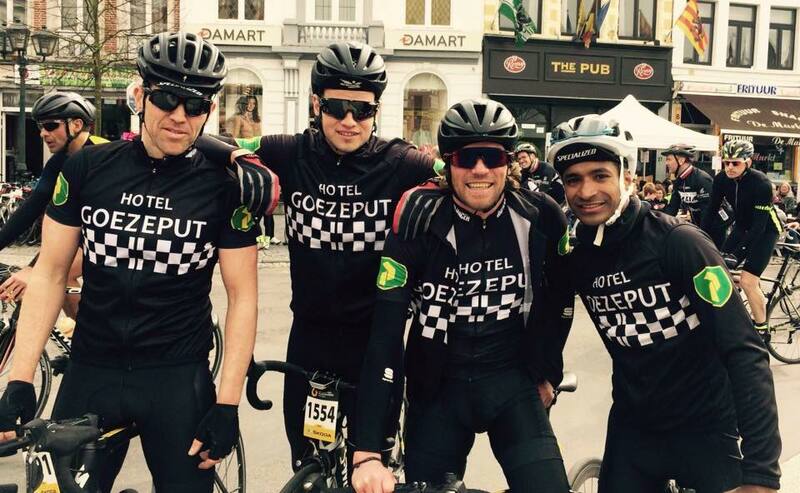 Overall, we had a great experience at Hotel Goezeput. Genial! Lo recomiendo sin duda. Muy buen trato y amabilidad de los propietarios, excelente situación, a sólo una calle de la calle de comercios..y a 5 minutos de la markt place. Volvería!!! The staff was extremely pleasant and helpful, room was comfortable and clean. Overall great experience! Spent many hours trying to find the right hotel for our stay in Bruges and eventually decided Hotel Goezeput ticked all the boxes. It was perfectly located. Beautifully spacious room and super friendly staff. Fantastic character to the building also. Would stay here again. Highly recommend it. Lovely stay at this hotel. Staff were so friendly and helpful throughout and the reception area was very welcoming with a fire and bar. Room was quite small and noisy from outdoors noise but the rest of it made up.for that. We waren van vrijdag t/m zondag bij jullie in het hotel. Vrijdag kwamen wij wat later aan, maar dit was geen probleem. Brugge is een heerlijke rustige en mooie stad en daar sloot het hotel prima op aan. De sfeer was prima en het ontbijt goed. De kamer was prima, al stond de verwarming wel wat hoog waardoor het erg warm was, gelukkig was deze gemakkelijk zelf aan te passen. Bij het uitchecken was er even wat onduidelijkheid, maar de service was vriendelijk en zo kwamen we daar snel weer uit. We hebben een heerlijk weekend gehad. The bathroom was a little smaller than expected. But everything was clean, the bed was pretty good, our breakfast was also good and we loved the hospitality and warmth of the hostess. It was an awesome stay at your hotel. Das Hotel ist wirklich sehr zentral gelegen. Die Atmosphäre ist familiär. Das Frühstück günstig und gut. Die Zimmerausstattung mittelmäßig. Die Zimmer in der obersten Etage aber ausreichend groß. Leider sind die Bäder sehr klein und die Lage verkehrsbedingt und dadurch, dass in Brügge die Straßen aus Pflastersteinen bestehen, nicht ruhig, da man die Fahrzeuge doch hört die vorbeifahren. Für eine Städtetrip nach Brügge kann man es empfehlen, wenn man keine zu hohen Ansprüche hat. 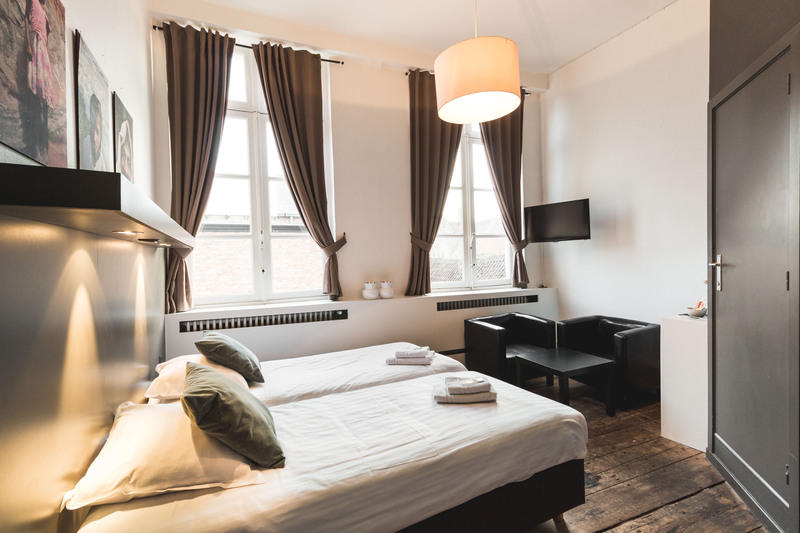 Hotel Goezeput is a lovely boutique hotel situated close to the church of Our Lady and Salvator Cathedral. Our room on the upper floor was spacious, with two windows offering nice views of the church steeple and neighborhood. Although there is no lift, the climb of 46 steps is worth it. Very comfortable bed and wonderful exposed beams, with a couch and easy chair to relax in. Good location for getting to the main shopping streets and Grote Markt, but quiet enough to take an afternoon nap. Breakfast in the hotel is just average, but there are plenty of nearby options if you desire something more substantial. Close enough to walk to the train station. We had a very pleasant stay. Mijn vriend & ik hebben echt genoten van ons verblijf! Wij hadden de simpele 2persoonskamer, echt een super mooie kamer! Mooie houten vloer, leuk uitzicht, zalige douche,... Allemaal leuk & lekker vintage / stoer! Het bed was ook echt heerlijk om te slapen! Ontbijt was fijn uitgebreid & heerlijk. We werden zeer vriendelijk onthaald, we mochten zelfs kiezen uit 2 kamers die nog beschikbaar waren. We vinden het echt jammer om terug thuis te zijn, we missen het leuke hotel! We komen zeker nog eens terug! Charming Hotel. Very clean. The room nice and komfortable. Only one disadvantage quite clairaudient. Hôtel parfaitement situé, à 10 mn du parking de la gare et 5 mn du centre de la ville. Très bon accueil, propre, fonctionnel... Nous avons eu le choix entre 2 chambres. Celle que nous avons choisie était très spacieuse et très calme. Je recommande entièrement cet hôtel. Great location. Very easy to get to the hotel from the train station. Make sure to get the door code if arriving after the front desk closes. Heel gezellig en charmant hotel op wandelafstand van het centrum. Eigenaar is superchill en een afsluitend drankje in zijn gezellige bar was geen probleem. Kamer was net en ruim. Er werd ons op voorhand niet gevraagd of we ontbijt zouden nemen. Toen we tegen het sluitingsuur van het ontbijt binnenkwamen was het meeste al op. Jammer. Maar als we nog eens in Brugge moeten overnachten dan zal dat zeker en vast in de Goezeput zijn. Tot dan! I had a very nice staying to the hotel Goezeput. The room was clean and very welcoming. The hotel has a perfect position: 10 minutes walking from the train station and 5 from the centre. The staff is very kind. The hotel is fresh renovated, conserving the old stile of the building with cosy wooden rooms, very well cleaned every day. Very near to al the most relevant cultural and touristic places of Bruges. The staff was very kind and helpful and moreover full of suggestions where to go for eating and visiting the town! I will definitely suggest everyone to spend their night here and I will certainly come back again! thanks. It was lovely to be there. The hotel is clean, quiet and in the center of the city. The public parking is close and cheap. Great location, good breakfast, comfortable beds & receptionist was helpful & friendly. We loved our stay in your attick room with all old beams. It is not the most quiet neighbourhood but then again wou are very central with lovely rooftop views. Breakfast was great. We´ll be back for sure! 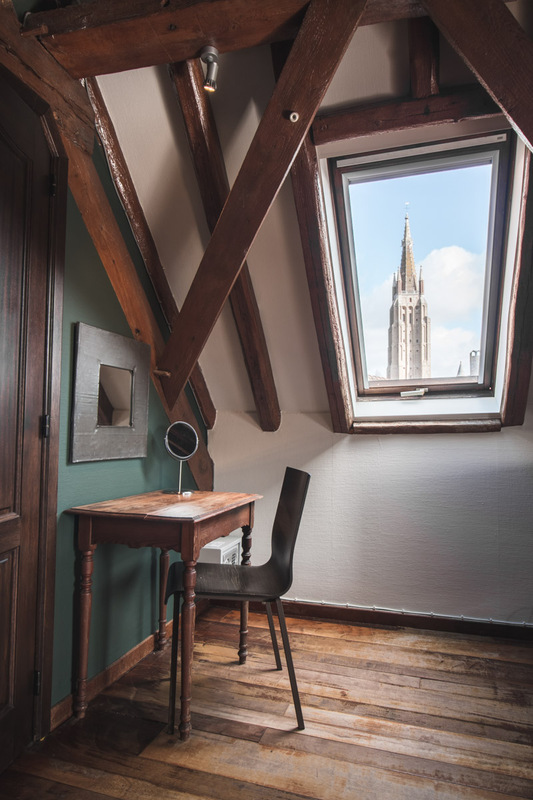 Hotel very well located, only 5 to 10 minutes walk to every famous spot in Brugge. The room was a bit noisy, due too strong wind and cars passing on the road (room on the second floor). I could hear No elevator makes luggage transport a bit difficult, especially for second floor rooms where the stairs are a bit narrow. Good breakfast. Good value for money. La ubicación perfecta. La recepcionista española, todo un encanto. Nos recomendó y ayudó con todo lo que necesitábamos. Hotel très sympathique, très bon accueil. Beau cadre et chambre très belle. Très bel hôtel, extrêmement bien placé, accueil parfait, gentillesse du personnel, un seul et unique inconvénient: l'isolation. aangenaam verblijf in charmante sfeer.Mooie kamers met voldoende plaats voor 1 overnachting. Was zeker prijs waard en heb al aangeraden bij vrienden en familie. Enkel aanmerking op de koffie die echt niet goed was. Buenas noche: Sin describir la sorpresa que nos llevamos del lugar... podemos decir q el hotel se encuentra en muy buena ubicacion, la habitacion familiar es muy comoda y tiene lo necesario para cuatro personas, el desayuno es de destacar, la armonia del interior es la celebridad de su personal. Todo muy atractivo. Saludos. Super mooi hotel. Vriendelijke mensen. Maar 1 min punt en dat is de 2 matrassen waren nog al lastig die schoven uit elkaar. Hotel Gozenput is a nice place which will be truly lovely when all the renovations are complete. 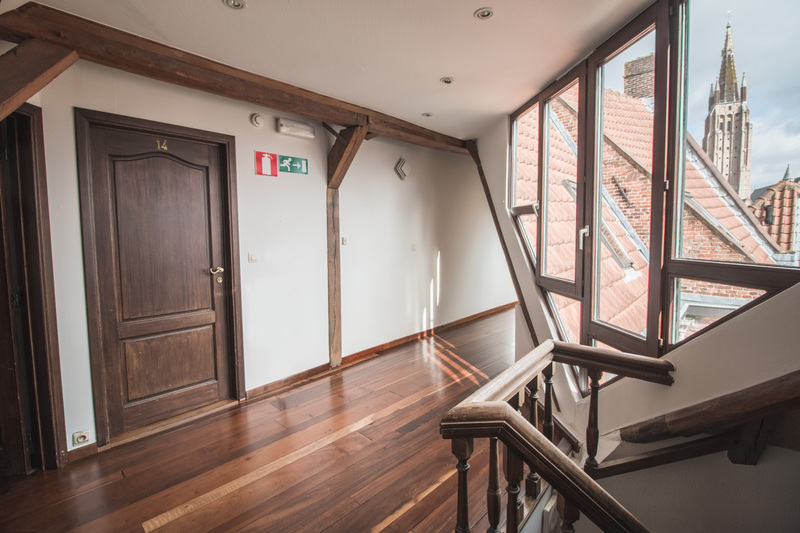 You can see the owner is updating so many areas with modern, tasteful additions while keeping the antique foundations of the building, from the staircase to colored door and Windows to original wooden flooring. However right now, the property just needs to keep moving forward. There are a lot of things unfinished and it seems that perhaps the owner is DIY it all himself as edges don't match or there are gaps in how the shower was installed. That said the beds were very comfortable and we had a great night's sleep. Breakfast was adequate and very standard but of nice quality. I would stay again. Beautiful old building with great character. Our room was characterful under the eaves with great views.The beds were very comfortable. The shower/ toilet combo was too small - shoehorned into the corner of the room.. The staff were pleasant and the breakfast very decent. Gute Lage, ruhig, freundliches Personal und günstig. Empfehlenswert ! Mooie hotelkamer nr. 14 (alleen badkamer dient nagekeken te worden: douchedeur functioneerde niet naar behoren en water liep niet goed weg) , goed ontbijt, goede locatie, vriendelijk personeel. We really enjoyed our stay at Hotel Goezeput! The location is perfect, our family room was spacious and clean. The bathroom was a little small for four people however. The bar and breakfast room downstairs are very cosy and the staff was very nice. An 8.30 am breakfast is a little late for a family with children. Loved this hotel! Delightful cozy and comfortable, and in a great location that made it easy to get everywhere. The staff was helpful and beyond friendly. Highly recommend! Great friendly well run smart hotel. Small and compact which is all you need when you just sleep there. Very clean, lots of character and friendly reception girl. Only thing we would change is a mirror in the bedroom and the charging point in the bathroom was impossible to access being right up against the shower! Otherwise definitely stay here and you won't be disappointed. Walking distance from everything. Excellent location, 10 mins from railway station, 6 mins from centre. Our room (#9) was a good size, very neat and clean. Bathroom was modern. Breakfast had a very good selection to choose from. Value for money was very good. Our room (at the end of the corridor) was quiet. Only negative we found was the shower could go from OK to scalding hot, or cold, quite suddenly! And the hair dryer was mounted high on the wall, but the cord was difficult to extend. The hotel was right in the old town. The room was very spacious with sofa, armchair and coffee table. Lovely views, friendly helpful staff and a good breakfast. Only minor criticism was the coffee was very weak. A great place to stay for the price. A very comfortable atmosphere and good price. It's a hotel I'll choose again next time in Brugge. Absolutely lovely hotel in an ideal location. Our room was full of character and had the most charming views. I would thoroughly recommend! Everything was fantastic, facilities, location, staff, bar. The ONLY small criticism was the noise outside our room up until 23:30. Otherwise great stay. Lovely little hotel. Location was fab, staff very friendly and helpful. Would stay here again. Would have liked tea/coffee making facilities in the room but this wasn't the end of the world. 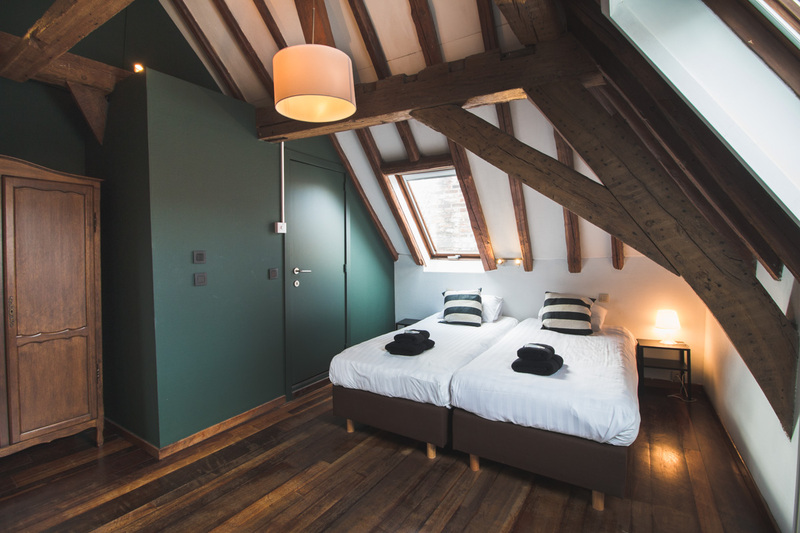 A really lovely place to stay.It has character and the staff are very friendly.Loved the beams in the bedroom and the cosy fire in the bar area.In a great part of Bruges. The only thing that was slightly disappointing was that the bar area closed early and we did not get a chance to have a night cap by the fire. Staff very friendly. Hotel really nice, older style but with modern touches really nice. Room was a good size but bathroom was a bit cramped. Curtains could do with a clean as they were a bit smelly. Would have liked to have tea/ coffee making facilities in the room. overall, it was a nice stay. Lovely quaint hotel. Close to main squares and Christmas Market area. Staff very friendly and helpful..Would definitely staff there again. Thank you for a wonderful break Belgium. Ich war sehr positiv beeindruckt sehr netter Service, sehr schönes Zimmer und sehr sauber!! das Frühstück war auch sehr nett für jeden Geschmach was dabei. ich werde auf jeden Fall beim nächsten mal Brügge wieder kommen.Danke! Lovely friendly hotel in a good central position to enjoy Bruges. Really enjoyed our stay. The hotel was in a great location and the room was nice, clean and comfortable. The room we stayed in (number 1) was a little on the noisy side as it was ground floor and next to the cellar for the bar however it didn't bother us. The bathrooms were very nice however you had to leave the door a jar due to the automatic light which was a little annoying if you wanted any privacy. Overall I would recommend the hotel highly and I would stay again if I return to Brugge. I couldnt stay in your hotel, i had a problem with my transfer, so i had to stay in brugge. De kamer (11) is niet groot maar door het hoge plafond ervaar je veel ruimte. Heerlijk geslapen want het bed was lekker zacht. Deurcode en wificode werken prima. Lekker ontbijt in sfeervolle ruimte met haard. Bij een volgend bezoek aan Brugge komen we weer naar Goezeput Hotel. We enjoyed our stay immensely. The rooms on the top floor are great - although the bathrooms are very small! Conditions in the hotel were correct. The personnel was nice and helpful. Lovely and clean hotel with good location. A little noisy at night outside our room (front facing room on ground floor) due to pub/restaurant guests outside. Plenty of character and lovely staff in a good location. The beds were very comfortable and the breakfast excellent. We were disappointed that our faulty bathroom lock wasn't fixed, which was awkward, and the cracked mirror was unfortunate. But we would be happy to stay again and recommend to others. Leuk hotel vlakbij de mooie binnenstad. Alles op loopafstand. Nog geen 10 min lopen van het station waar voor 3.50eur per dag geparkeerd kan worden. Aanrader! Friendly staff, good location, and good wifi. The room was clean. I will recommend it to my friends. A fabulous hotel in an excellent location. Our first city break with our teenage children and they were blown away with their room. The rooms were incredibly clean and the staff were lovely. We will definitely return to the hotel again in the future. Great location, great rooms and great staff. Definitely recommend to anyone and everyone. It was short, but very nice stay. The room is small, but elegant and perfectly comfortable. Lovely bathroom. Wij hadden kamernummer 5 en vonden de matrassen erg zacht en hadden het gevoel in een kuil te liggen. De badkamer was prima en de douche heerlijk. The hotel has a good location, a quiet night and a very kind and helpful staff ready to solve problems immediately. The staff was immediately to repair my shower drain clogged the moment I complained about it. The hotel was very cozy and comfortable. The rooms had a great view, conveniently located, and the architecture was nice. The receptionists were very friendly and helpful! Me gusto mucho el hotel, esta muy cerca del centro, es limpio y calentito y la ducha de la habitacion privada funciona muy bien. Si vuelvo a Brujas repetiria. Un saludo desde Malaga, España. Great hotel! 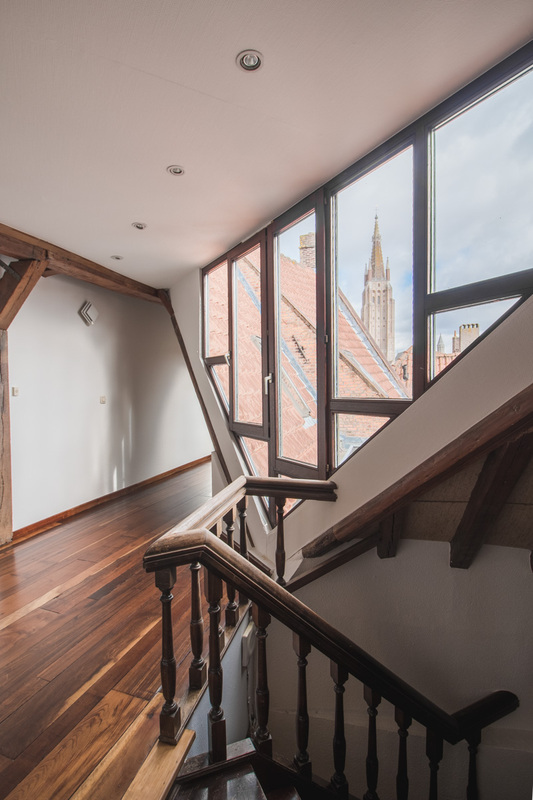 Very charming rooms with exposed rafters, creaky floors, great location. The hotel owner/manager was very helpful. Great breakfast, good rate. We hebben een zeer fijn verblijf gehad bij Hotel de Goezeput! De ligging is fantastisch en de kamers zijn goed. Ook het ontbijt was erg lekker! We werden hartelijk ontvangen. Kortom; een echte aanrader! Good value for money. Very kind staff. Tiny bathroom. Not very good breakfast. Very cute aesthetic in this charming little hotel, with lots of original dark wood mixed with a modern touch. Good location, easy to get to but still enough off the main area so not very noisy. Beds are a bit too soft, and you can easily hear your neighbors but that's really the only complaint. A lovely hotel. Lovely little hotel with friendly and efficient staff. Location is excellent. Bonjour, Nous avons beaucoup apprécié votre accueil et la qualité des prestations de l'hôtel. Son emplacement au coeur de la ville est appréciable. Yes, we enjoyed our time at Goezeput and in Bruges. Great location and the staff were very helpful. Zimmer und Bad waren sauber. Vieles war nicht in Ordnung: die Schiebetür der Dusche war defekt und hing völlig schief, der Deckel des Abfalleimers war defekt, der Kleiderschrank ließ sich nur schließen, indem wir ein Kissen davor stellten, die Lampe über dem Bett hielt nur noch an der Verkabelung und war nicht befestigt, ein Dielenboden im Fußboden war eingebrochen. Als wir am Samstagabend um 20.45 Uhr im in der Bar ein letztes Getränk nehmen wollten, wurde uns mitgeteilt, dass die Bar jetzt schließen würde. ... Gut, dass wir noch Wasser auf dem Zimmer hatten, aber ein angenehmer Aufenthalt war es sicher nicht. Gerne stellen wir Fotos zur Verfügung. It's a good hotel for a few days. Had a lovely 3 night stay in a deluxe room which was spacious, comfortable and quiet, just what I was looking for. The staff are very friendly and helpful which makes a huge difference when staying in small hotels. The location was excellent with easy walking to the key sights shops and restaurants as well as only a 10 - 15 mins walk to the station. We zijn tevreden over ons verblijf.